The MCEM91, electromechanical point machine, installed at the track side, provides a load translation to a maximum of 6000N for a 260 mm stroke. This point machine allows its locking and its detection in end position. The MCEM91 point machine is used to drive turnouts with high cycling rates using moderate loads (conventional lines and metro), to heavy loads (high speed lines, heavy-haul networks). 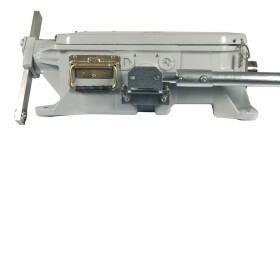 This MCEM91 point machine with a single rod provides the drive function. This rod can be integrated into a bearer and thus allowing mechanised tamping.